MANILA, Philippines - Senator Grace Poe officially announced her plans in the 2016 national elections at the UP Bahay ng Alumni in Quezon City on Wednesday, September 16. Poe officially revealed she's running for president. "Ako po si Grace Poe, Pilipino. Inaalay ko ang aking sarili sa mas mataas na paninilbihan bilang inyong Pangulo." "Sana po ay samahan ninyo ako sa pagpanday ng maganda at makabuluhang hinaharap ng ating inang bayang Pilipinas." The announcement was done after months of speculations, meetings, decisions of who will be the next candidates for the highest position in the country as President Benigno Aquino III's term is about to end next year. 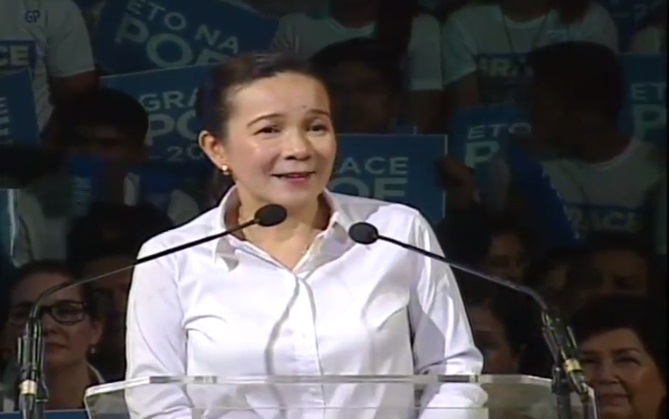 The venue is where her father, the late actor Fernando Poe Jr (FPJ), delivered an emotional speech before a huge crowd in 2003 after declaring his candidacy against then President Gloria Arroyo, said a staunch FPJ supporter.